When considering an event space to leave a lasting impression, nothing is more interactive, elegant and accommodating than King Shabu Shabu. We have expanded our restaurant and can now host private parties any day of the week. Shabu-Shabu is a type of Japanese cuisine that involves the diner cooking fresh, seasonal vegetables and thinly sliced meat in a steaming pot of water at their table. Traditionally, the primary meat cooked is beef, but modern cuisine has evolved to include other meats and seafood. 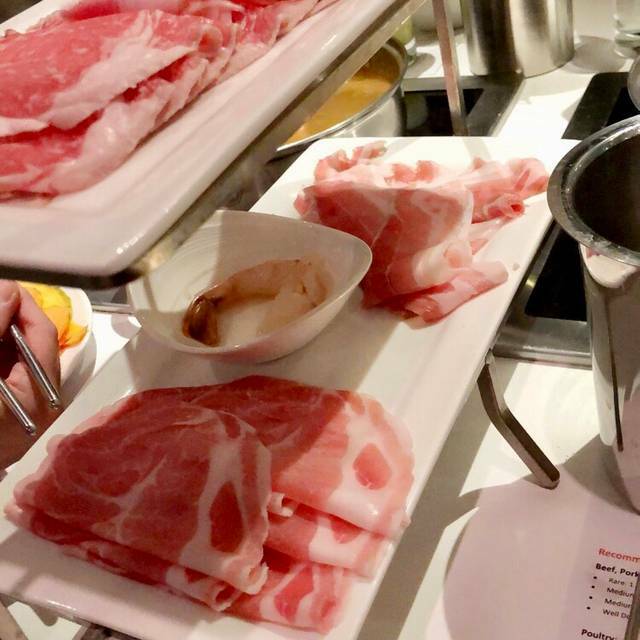 At King Shabu Shabu, we serve several grades of premium beef, including Japanese A5 Wagyu; Berkshire pork; free-range chicken; lamb and a variety of seafood. Vegetables, rice, dipping sauces and noodles are served with each entrée. Our full-service bar includes craft cocktails, draft beer, fine wine, chilled sake and the most extensive selection of Japanese whisky on the North Shore. At King Shabu Shabu, we strive to give every customer a memorable dining experience. Come join us at the steamiest restaurant on the North Shore! The finest seafood brought to market and delivered fresh daily! Thinly sliced to cook under 2 minutes. Delicious with our dipping sauces! We love hot pot so were very excited to find this place. The service was amazing. Some of the best service i've had. All the servers were helpful and knowledgeable. We were not aware that if you sit at the bar you can order from their all you can eat menu. Need to go back to for that. The quality of food was very impressive all the seafood and cuts of meat were fresh. I did read other reviews about the broth ending up bland. And I do have some tips for new comers. We did not find the spicy miso broth spicy so ask for 2 spoonfulls. Add a generous amount of salt and pepper, use the chili garlic for added heat, and a small dollup of ponzu for citrus. Then ask you waiter for lime slices. Add your veggies right away. The veggies add flavor as well. We removed our veggies by the time our protein came. We put all the veggies over rice and added lime juice and tahini. Use the lime juice on top of finished meat and seafood. My husband got the seafood combo and it was well worth the cost for the amount of food he got. I got 6 oz ribeye and ate a lot of his seafood as well. Well worth the visit! We came for my husband’s birthday and our first time dining. The staff was so attentive and even sang my husband happy birthday and had an assortment of mochi ice cream for his complimentary dessert! Will definitely be back. Food was great and experience was excellent. We came with our four young children and they all enjoyed it. Enjoyed the experience at King Shabu Shabu very much. Quality of the food was very good, fresh and generous portions. Service was excellent. A friend and I were celebrating our birthdays. This is the third time I’ve dined here. Sadly to say, the first was the best visit and this was most disappointing. I made a 7:45 PM reservation but no table was available for us until 8:15 PM. When We were seated no one told us that the kitchen had run out of dipping sauces and the spices one would add to the pot. We learned of this half way through the meal. They must have some challenges in retaining good staff. Despite this, the food was tasty and the drinks are always good. I’m just disappointed because we brought a new couple there and I wanted to impress them. It was Great healthy and fresh food. The prices were good and affordable. It was fun to do too, to cook ourself. boring atmosphere but we were having fun with friends talking and cooking. I was surprised the noise level was ok. The food and service is always excellent . One of our go to places for celebrations ! Love this place. Healthy,I load my broth with flavorful spices and have a great soup to take home for next day treat. Enjoy a leisurely paced meal. Great experience. We absolutely love this restaurant!!!! I go for lunch and dinner as often as I possibly can, since I live in Wisconsin. 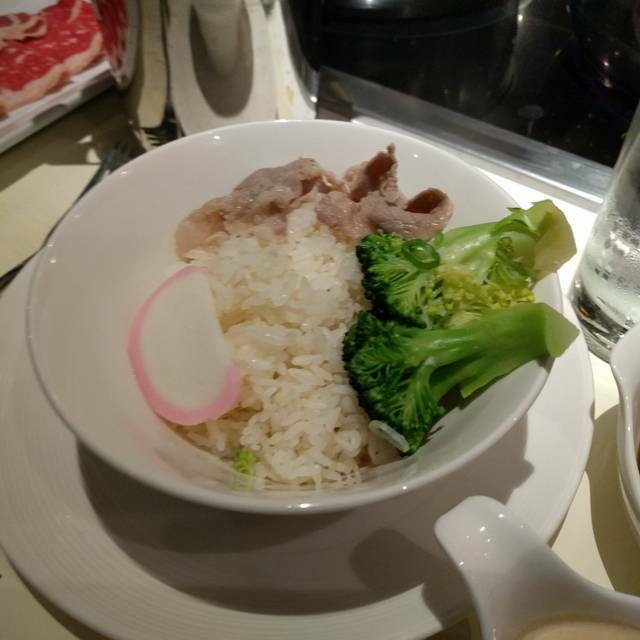 Cravings for their superb fresh meats, vegetables, friendly staff lends me to create a whole day in Illinois around King Shabu Shabu. Excellent! Looking forward to going back soon. The food was very fresh and tasty. It was very clean. A fun experience. Excellent meal! High quality food, top notch service and a great dining experience! Amazing restaurant, awesome food and cocktails! The service was outstanding! Highly recommend!!! This is the second visit. I was so impressed by the first visit that my husband and I came back. This time was a little less impressed. Probably because it was just the 2 of us without friends so no distractions. This time I realized that its pretty expensive to eat there compared to other shabu shabu places. The food is delicious but you have to pay extra for rice and veggies which normally would be included in the price. Otherwise its a great place and the bartended makes great cosmopolitan martinis. Good experience. Good service. Owners are friendly and engaging. Service great. Our first visit. We asked for a quiet table and they accomodated us. We sat in the back and had a blast! So much fun to make our own dinner. As others have said, put all the veggies in the pot, for added flavor. We'll be back. I am totally in love with this place. The food is amazing and super healthy. The food, my date, and server (Lana) made up for the poor management and host (either stressed or not meant to host). If you and your date are low maintenance and is satisfied by good food and each other, I might recommend King Shabu Shabu. We went here for my birthday and it was a great choice. Good food and nice servers. Will certainly be back. Great selection of meats and seafood to cook in front of you. Preferred the taste of the beef rather than the shrimp. Next time will try the pork and chicken. Truly great staff, cozy, friendly, welcome environment. Kyle and the staff are awesome, intelligent and helpful! Fantastic concept of healthy, interactive dining. Great first date spot! I love shabu shabu so when I drove by this restaurant and saw the name I decided I had to go. This last Saturday night my husband and another couple went to dinner at this restaurant. It was great fun. The retaurant is nicely decorated and inviting. The host was friendly and made drinks for us. It has a full bar and you can get good drinks not just sake. The tables were comfortable to sit at and the shabu shabu pots easy to operate. The food came in huge portions and tasted great. I cant wait to go back again. Love this restaurant! Always greeted with a smile. Brody the waiter is always terrific! Really adds to the experience. Concept and food is great. Has become a regular dining place for me. Always a pleasure to dine here and great food. The servers enhance the dining experience. My new favorite spot for a wonderful healthy meal! Not only do they have healthy tasty food, but the whole experience is an adventure. With a quiet ambiance, it's a great place to have a wonderful dinner and still hold a conversation. The sauces and flavors combined with the fun of the hot pots on your table make this a dining adventure. I can't wait to go back. Oh...they have awesome drinks, wine, and beer options too. And there's hot pots at every seat in the bar. Maybe next time I go I'll sit at the bar ! Absolutely delicious! Eating here was a fantastic experience, and I cannot wait to try all the other appetizers and cocktails (and also an incredible selection of Japanese whiskey). My favorite meats were the rib-eye (including real Japanese grade A5), sashimi-grade salmon, and the clams. When eating here for the first time, it may be a bit out of your comfort zone cooking your own meats at the table, but the servers there are very friendly and knowledgeable. They will guide you through everything you need to do. Eat here once or twice, and you'll be an expert after that. I look forward to coming again! Food and drinks are consistently delicious. Incredible dining experience with mouth watering cuisine and fine dining service. Try it! You’ll be looking for excuses to go back again and again. Love this place! Great food great eating experience, promise you won’t walk out hungry! Our grandson asked us to take him here. It’s his new favorite restaurant. He’s eight years old. We loved it too!